We want feedback from our Blog readers. What's on your mind or a do you have a specific question. 63,216,431 people used Craigslist in the month of September. Based on this information, do you think there may be a slight possibility that you could generate additional leads and sales using Craigslist real estate marketing strategies for your business? Although the answer to this question should be a resounding "yes", there is certainly a right and wrong way to use this platform. Unfortunately, with our years of experience working with agents, investors and brokers around the country, we have found that many professionals are not initially implementing this technique correctly. Here's the major issue we have found. Since Craigslist closely resembles a form of traditional classifieds based advertising, a majority of users choose to utilize this real estate marketing tactic by simply running basic ads with no or a very poor call to action. We cannot expect visitors to contact us directly. Instead, online marketing strategies require us to be proactive instead. For instance, if you were to spend 15 minutes scanning over local postings on Craigslist, you would typically find a lot of listings that rattle off a bunch of features and benefits of a particular home, with perhaps a link to a website or property search tool. However, the problem with this approach is that 95% of the population is doing the same exact thing! Unless that prospect is ready to buy or sell on the spot, your ad could quickly be glimpsed over with no action being taken. The difference with using Craigslist real estate marketing strategies is that you must focus on lead capture instead of simply advertising your goods and services to a huge marketplace. True, this is a super simple concept to grasp, yet too many real estate professionals are still following outdated methodologies to build their lists. Consequently, this calls for a complete mindset shift in order to fully take advantage of all that Craigslist has to offer. Gripping Headline: What makes your listing or offer unique? Focus on features, benefits, and pain points that will grasp your audienceï¿½s attention. This has to be compelling to get people to first click on your ad. Image/Banner Ad: Once a person opens your ad, the very first thing that should draw their attention is an image or banner ad with a very strong call to action. The offer should be something that will speak to your audience and cause them to click over to your opt in page. Property Info With Link: This portion of the Craigslist real estate marketing ad should be very short and to the point. The property information can be followed by an HTML link that directs to a property specific landing page with lead capture for future follow up. Final Call to Action: You can finish off your sandwich with an image or text link call to action. Create a twist on your top offer leading to the same landing page, or perhaps target buyers on your first image ad and sellers for the bottom portion. Why it works: Properties listed in the MLS are for sale. This may seem like an obvious statement, but some of the other methods touted as great ways to find deals involve locating owners, then finding out if they want to sell. Properties in the MLS also have the advantage that all of the information about the property is pretty much laid out for you - a major time saver. And, with the sophisticated, computerized access available to your agent, it's a matter of a few keystrokes to view all of the properties that are handyman's specials, or bank-owned, or in estate, or priced under a certain dollar figure - whatever you’d like to concentrate on. Another reasons that the MLS has worked so well for me is that I am generally in the market for really ugly properties. Coincidentally, these are the same properties that most agents prefer not to spend a lot of time with. In many cases, they're downright cooperative - particularly when I'm offering all cash and a quick closing. Bad: Direct mail to real estate agents. In 1994, I had the brilliant idea that I might be able to find MLS-listed properties even faster if I simply let agents know what I was looking for. So I purchased 1,200 agent names from the Board of Realtors and generated a 3-part mailing send to every agent in town. The theme of this campaign was this: if you, Ms. Agent, have a property listed that fits my criteria, I’ll make an offer and you get to keep the entire commission. Out rolled my brilliant campaign -all mailed first class, incidentally - and in came the phone calls. All 7 of them. That’s right. The week after the first letters went out, we got 7 calls. We had already made offers on three of the properties; two were out of our price range; and two were overpriced listings about to expire. The next mailing generated even more results - about 15 calls - all basically in the same categories. The final mailing, a postcard, received no notice at all. Basically, I wasted about $1400 on a campaign that generated absolutely nothing. What went wrong: I still think that this idea has some merit, but if I do it again, I'll make some major changes. First, I'll target only the 200 or so agents who list the types of properties I buy. Second, I'll do a better job of writing the letters, emphasizing how the agent and his seller would benefit from working with me. Third, I'll make my campaign a continuous one throughout the year, testing different letters for response and mailing the best to the same agents over and over. And lastly, I'll personalize the campaign by following up with a phone call to the 50 or so best prospects. Oh well, live and learn. Good: Ads in the Yellow Pages. For 8 years, I've had an ad in the "real estate" section of the Yellow Pages. Each year, the ad has had some variation of the wording, "I buy houses - all cash”. This ad only generates 3-4 calls a month, but for some reason the quality of the calls is better than those that are generated by any other method I've ever used. The sellers tend to be motivated, cooperative, and have unlisted properties. Why it's worked for me: I love that you deal with these ads once a year, then forget ‘em. While they’re pricey - up to $3500 per year - the phone company will generally bill you monthly for the cost. In addition, as one of the very few ads in the phonebook that promise to buy houses, I haven’t got much competition. Bad: Advertised FSBOs. Properties For Sale By Owner, a.k.a. FSBOs, are a favorite for some real estate investors. I, on the other hand, have never purchased a property from an owner who advertised his property for sale rather than calling me. I've found several problems with trying to buy FSBOs. The first is that some are not actually for sale. Some FSBOs are just “testing the market to see what kind of offer’s he’ll get. Other FSBO sellers are very motivated to sell, but don’t list because they want to keep all of the money from the sale. They don't want to pay a commission - but they don't want to take a lower price, either. And sometimes a seller chooses to try to sell their property by themselves because they owe too much to pay a 5%-7% commission, even if he sells it at full price. If you are buying expensive homes creatively, these sellers are ripe for the kind of solution you offer. My strategy is to buy ugly houses cheaply and for cash, and I just don't find this type of deal in advertised FSBOs. Good: Flyers to Targeted Neighborhoods. Last year, I had 10,000 double-sided "I buy houses" flyers printed. I hired someone to put this flyer in the door of every one, two, or three family property they saw in my “farm”. Every 3 weeks, 3,000 of these flyers were delivered, and the response from qualified sellers was excellent. For a cost of less than $500, I made two deals that netted over $6,000. Absolutely nothing. Not one single phone call. Not even from an unqualified seller. Not even a wrong number. Nothing. The Moral? Stick with What works. Good: Flapping my gums. Luckily, talking - a lot - is something I have little problem with. Laugh if you will, but my willingness to talk about what I do to anyone who will listen - or even pretend to listen - has made me a lot of money. For instance, when my new hairdresser asked me what I did for a living, I responded that I buy and sell houses. His immediate reaction was, "really? How pretty do they have to be?" Long story short: I bought his unwanted junker house for $4,000 and sold it for $7,000 the same day. When my attorney wanted to know what type of assets I wanted to protect, I told him about my house-buying business. Four months later, he referred a client to me who sold me a $35,000 property for $12,000. You get the picture. Ugly: Not knowing which of your deal-finding strategies are working, and which aren’t! If you’re going to spend money on flyers or ads or telephone pole signs or whatever, it’s very important that you pay attention to which methods are generating good leads, and which are duds. In looking over my own deals was very surprised to discover how many great deals came from attorney referrals - a strategy that I haven’t pursued aggressively, but will in the future. If you aren’t tracking your lead generators to discover which are working and which you should give up, you’re wasting time and money that could be put to use making you deals. More real-estate investors are seeking solid returns. But they're not buying homes. They're buying mortgages. As the residential market bounces back, investors are showing renewed interest in buying mortgage-backed securities—loans that the lenders have bundled and sold as consolidated debt. Since selling off jumbo mortgages lessens lenders' risk, more banks, credit unions and other financial institutions are offering jumbos. And more competition could mean better terms for consumers. In the first quarter of 2013, $4 billion worth of jumbo loans were sold by lenders, more than the $3.5 billion total of securitized jumbos in all of 2012, according to Guy Cecala, publisher of Inside Mortgage Finance. If the pace holds through 2013, the volume of securitized loans could reach $16 billion, Mr. Cecala said. However, while a 400% annual increase is significant, $16 billion still represents just 7% of the $220 billion volume projected for jumbo loans in 2013, he added. Lenders issued $203 billion in jumbo loans in 2012, and securitized loans accounted for less than 2% of that total. "The vast majority of jumbo loans aren't securitized still, and the [secondary] market has a long way to go to be any reflection of what it used to be before the housing crash," Mr. Cecala said. Before 2008, as many as two-thirds to three-fourths of all jumbo residential mortgages were securitized, he said. Then the mortgage meltdown occurred, and investors shunned jumbo securitized mortgages in favor of investments containing pools of government-backed mortgages by Fannie Mae FNMA -0.50% or Freddie Mac, FMCC -1.59% which only guarantee loan amounts up to $417,000 in most of the U.S. and $625,500 in pricey metro areas, such as New York and San Francisco. That dearth of the "secondary market" meant lenders had to hold any jumbo mortgages, which are above those dollar limits, on their books. Redwood Trust Inc. RWT -0.64% was the first player to re-enter the jumbo secondary market in 2010, and the real-estate investment trust (REIT) has announced plans to securitize $7 billion in jumbo loans in 2013, three times more than its $2 billion volume in 2012. Its success has triggered more investors, including Credit Suisse, CSGN.VX +3.06% Shellpoint Partners, JP Morgan Chase & Co., Two Harbors Investment TWO -0.27% Corp, and PennyMac Mortgage Investment Trust PMT -1.65% . The secondary market's rebirth has allowed EverBank Financial Corp. EVER +0.12% to offer 30-year, fixed-rate jumbo mortgages, said Tom Wind, executive vice president of residential and commercial lending for the Jacksonville, Fla.-based bank. Interest rates for a 30-year, fixed-rate jumbo mortgage were 4.20% on May 31, just 0.13 basis points more than the 4.07% rate for a conforming mortgage. EverBank sold its first pool of securitized prime jumbo loans on the secondary market in April, netting $307.4 million, according to a Securities Exchange Commission filing. The lender anticipates bundling and selling more jumbos this year, Mr. Wind said. The ability to sell loans has allowed San Francisco-based RPM Mortgage to expand its jumbo originations by 233% from 2011 to 2012, said Julian Hebron, vice president of the San Francisco-based boutique lender. RPM is now the second-highest volume lender to home buyers in the nine-county Bay Area, where jumbos now account for 48.1% of all purchase lending, according to DataQuick MDA.T +0.76% . RPM's year-to-date 2013 jumbo production already has exceeded its 2012 total, Mr. Hebron said. • Credit qualifications remain tight. Investors look to buy securitized loans from lenders with tight qualification standards for borrowers, so solid credit scores, high down payments and excellent loan-to-income ratios are still important, Mr. Wind said. • Customer service. When lenders securitize loans, they sometimes retain servicing, and sometimes the purchaser takes it on. Currently, RPM retains servicing on 40% of its jumbo loans, but Mr. Hebron said he hopes the expanded secondary market will allow the firm to increase that number to 80%. "We want to remain the point of contact for our customer," he added. • New rules coming. New Consumer Financial Protection Bureau regulations take effect in early 2014 that may require lenders and/or securitizers to hold 5% of the amount of securitized loans that aren't qualified mortgages. Some loan types, such as interest-only loans, may be more difficult for borrowers to find, since securitizers will be less likely to want to buy them from lenders due to the 5% rule, said Keith Gumbinger, vice president at HSH.com, a mortgage-information website. A version of this article appeared June 7, 2013, on page M5 in the U.S. edition of The Wall Street Journal, with the headline: Investors Revive Market For Bundled Mortgages. Retailing giant Wal-Mart Stores' annual shareholders' meeting this week showed signs of the company's recent turbulence, as protesters assembled at corporate headquarters to shout slogans and demands. Despite a court-issued restraining order, the protesters, including workers who are on strike, decried low wages and called for better safety procedures for supply-chain workers. And some of their views were heard inside the meeting, as well. The strikers were in Bentonville, Ark., with the support of the United Food and Commercial Workers Union and the labor group OUR Walmart. Inside the meeting, the lineup of speakers included "former Bangladesh child garment worker turned activist Kalpona Akter, as Jacqueline Froelich reports for Newscast, from Arkansas member station . Akter took the stage to deliver a speech recommending the adoption of Proposal No. 5, a measure that would give shareholders of 10 percent of common stock the ability to call a special meeting. Such meetings would be useful, she said, in crafting responses to incidents such as the recent collapse of the the Rana Plaza garment factory complex, which killed more than 1,100 people in Bangladesh. After that tragedy, several large European clothing companies said they will band together to create a program for inspecting factories and ensuring safety upgrades to protect workers. Last month, Wal-Mart said it would not be part of that effort, preferring instead to create its own plan, as . That didn't satisfy Akter, who noted that repairs that would make the company's factories safer had been deemed too expensive, despite equaling "just two tenths of 1 percent of the company's profit last year." "Forgive me, but for years every time there's a tragedy Wal-Mart officials have made promises to improve the terrible conditions in my country's garment factories, yet the tragedies continue," . "With all due respect, the time for empty promises is over." Wal-Mart employs more than 2 million people around the world, . It generated sales of around $466 billion in fiscal year 2013. Friday, Wal-Mart executives unveiled a plan to buy back $15 billion in stock. Despite appearances by celebrities Hugh Jackman, Kelly Clarkson, John Legend, and Tom Cruise, Wal-Mart's 2013 meeting brought serious concerns along with the company's celebration. "This year's shareholders' meeting comes at a time of turmoil for the world's largest retailer, which finds itself dealing with empty shelves, labor unrest, bribery scandals and tumbling sales," as . 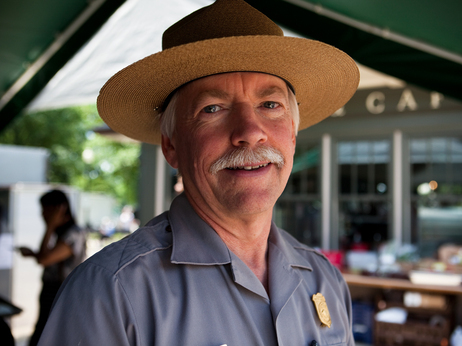 he director of the National Park Service doesn't have anything against hot dogs or pizza being served in eateries in national parks. "But I wanted more options, and more healthy choices," told me at a tasting event this week to unveil for the concessionaires who operate more than 250 food and beverage operations in national parks. "There is no reason that you should have to take a vacation from eating well when you visit a national park," Jarvis told a group that had gathered on the National Mall to sample some of the most innovative new menu options. As Jarvis announced details of the initiative, the crowd was distracted by the wafting aromas of sauteing crab cakes, a creation of chef Steven Sterritt of in Shenandoah National Park. "These are fresh jumbo lump Maryland crab with a roasted garlic béchamel sauce. ... It's pure crab, no filler at all," Sterritt told me. Wow. That's a far cry from fried chicken tenders. Jonathan Jarvis, the director of the National Park Service, announced a new initiative to offer more healthful food choices at national parks starting this summer. And instead of fries or potato chips, there were house chips made from beets and other vegetables. "We are changing to a healthier fare, of course," Stefan Larsson of Yellowstone National Park told us as he served up things I'd never seen in national parks before. "This is bison tenderloin," served with a dollop of horseradish sauce, Larsson told us. "Bison is flavorful and lean meat." Also on the menu: regional huckleberries, a rhubarb gazpacho and a brie-style cheese produced in the Yellowstone region. "So, are park visitors surprised to see these kinds of dishes?" I asked. "Yes, I think so," Larsson told me. But folks are also usually impressed to find the regional cuisine and the fresh approach, he says. Turns out there's only one flop, so far. Apparently, park visitors are not too keen for his take on ostrich meat. Hmmm. Perhaps the pace of change can come too fast. The new standards are based, in part, on changes already in place in parks like Yellowstone, where concessions are run by . As part of its Healthy and Sustainable Cuisine program, the company has pledged to adhere to naturally raised meats, cheeses from regional farms, no high-fructose corn syrup and baked goods sweetened with 30 percent less sugar than traditional preparations. To usher in the new Park Service food initiative, the White House sent over of the campaign, who noshed on almond-crusted baked chicken with a fennel salad. "You know, baked is the new fried, so that looks delicious," he told the chef. Kass told the group that the new initiative is "an important step toward making the healthier choice the easy choice for parents and kids." And after tasting the baked chicken: thumbs up? Low-fat yogurt parfaits with berries are currently sold in kiosks along the National Mall in D.C. 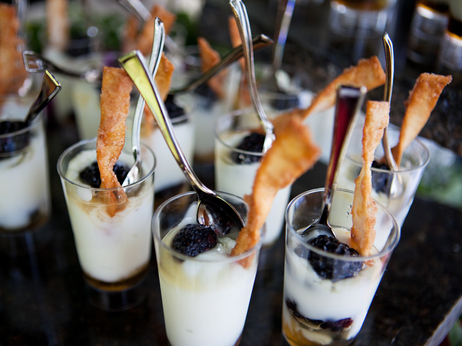 The version served at the tasting event came topped with cinnamon wonton crisps. "Absolutely delicious!" Kass said, congratulating the chefs from . and , two additional companies that operate park concessions. "That's really innovative." Aramark's vice president for food and beverage, , told us that his company has worked with regional wholesalers to procure more local produce and meat. And how does the new park food initiative influence the bottom line of the companies serving up the food? Well, , president of Delaware North, which has a contract to run eateries at Shenandoah National Park, didn't hold back in answering me when I asked. "We're a commercial company, and we're in this to make money," he told me. Abramson says there's demand for these new options: "What the market wants is what we deliver." So does this new initiative mean park visitors will pay more? Not for basic concession-stand foods like pizza or ice cream, which will be staying on the menu. But the Park Service says even the newer, fancier offerings will still be affordable. FORTUNE -- Today, for the first time, more people worldwide live in cities than in the countryside. What's often missed in this equation is how fast this trend will accelerate. Take China. Currently 650 million people, or 52% of the population, now live in cities. Fast-forward only 10 years or so, and that number is expected to hit one billion. That means that some 350 million people, the equivalent of the entire population of the U.S., will move from the Chinese countryside into urban areas. The number of Chinese cities with a million or more people will hit 221. This migration presents a challenge. China's urban dwellers on average consume three times more energy than rural ones. That means we must design new cities and rebuild old ones in ways that will allow billions to live, drive, eat, and work sustainably. At today's session on Rethinking Our Cities at Fortune Global Forum in Chengdu, Zhang Yue, the CEO of Broad Group, a maker of energy equipment and a real estate development company, said that we have to totally redefine what it means to live in cities. "People don't want to have to get on trains or drive a car to get to work," he said. One solution: Zhang plans to lick the urban congestion problem by building up. His proposed high-rise prefab in Hunan Province called Sky City will soar 202 stories to a height of 838 meters. Zhang says that Sky City can be built in seven months compared to at least five years for other super high-rises and is five times more energy efficient. The building will save some 200 hectares compared to typical sprawl development in China and will contain offices, schools, playing fields, stores and restaurants, reducing dependency on the automobile. Says Zhang: "Sky City will take some 2,000 cars off the road simply because its residents can find most of what they need right where they live." Another proponent of smart cities is Jean-Pascal Tricoire, the CEO of Schneider Electric, the French company that offers solutions for power, grids, traffic systems, and more. Tricoire says cities can embrace social media to make them run more sustainably. "Parisians," he says, "spend a year of their lives looking for parking spaces." He says his company is working on systems where drivers can tap into social media and find an empty parking spot or avoid traffic jams. David Cote, the CEO of Honeywell (HON), the industrial giant that has more than 50% of its portfolio linked to energy efficiency, gave a telling example of how the city of the future will require dramatically less energy. The company has designed building management systems that integrate core systems such as HVAC, lighting, and security that maximize energy usage while providing cost savings. So the world has recognized the challenge of making our cities more sustainable and has the technology to do it. Cote says that's not enough. "We can't let this process be chaotic. We need much more planning. We need to get a lot of smart people in a room to figure out how to make all this work." The three executives on this panel would certainly be well-suited to lead the discussion. Please let use here from you. I promise we will not barrage you with crap. We do not have the time and we really appreciate your input on any subject. Great article. Thanks for the info, you made it easy to understand. BTW, if anyone needs to fill out an IRS form 709, I found a blank form in this link http://goo.gl/fmX2Vc. This site PDFfiller also has some tutorials how to fill it out and a few related tax forms that you might find useful.